﻿ SMALL BLOCK V8 LONG WATER PUMP A6 A/C COMPRESSOR BRACKETS | Vintage Chevy Trucks - We are the largest parts supplier in the world for your 1967 - 1972 Chevy or GMC Truck! 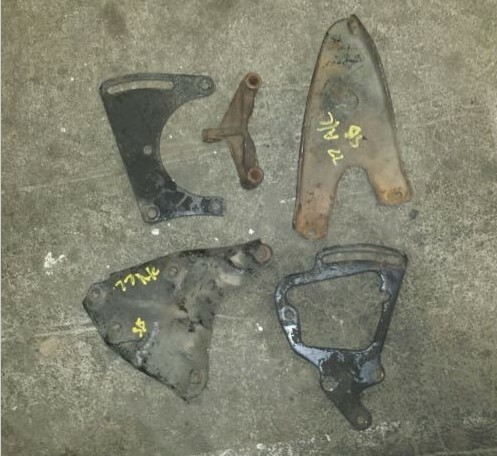 USED SET OF 5 CHEVY, GMC SMALL BLOCK LONG WATER PUMP AIR CONDITIONING BRACKETS. 305, 350, 400, ETC... BRACKETS MOUNT THE A6 COMPRESSOR ON THE DRIVERS SIDE OF THE ENGINE. CAME OFF 1973-1980 CHEVY, GMC TRUCK. FITS 1969 TO 198? CARS. CAME OFF CALIFORNIA TRUCKS. ORIGINAL GM BRACKETS. KEEP YOU CAR AND TRUCK GM! CALIFORNIA BUYERS HAVE TO PAY SALES TAX.